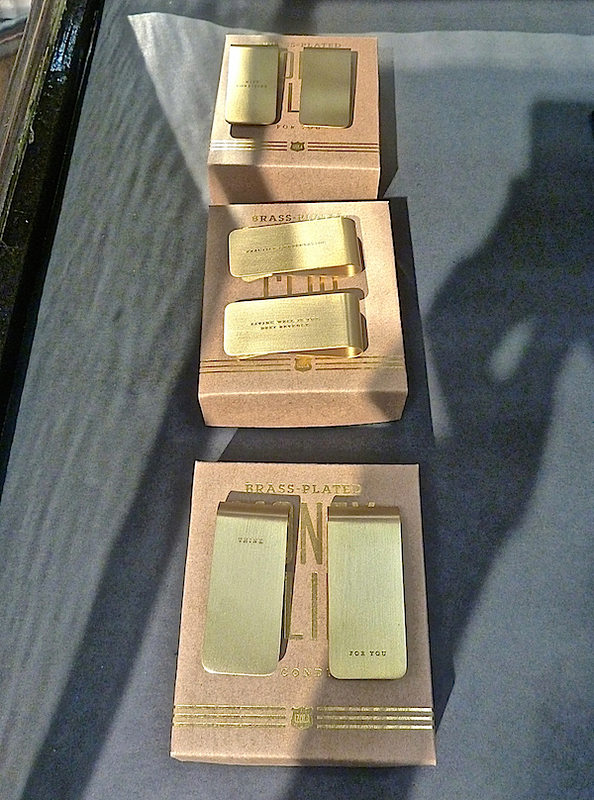 The mania for brass and gold tones continues as warm metallic finishes extend their dominance at NY Now Market. Whether considering furniture, accessories or linens, it appears that it will be another sparkling holiday season. 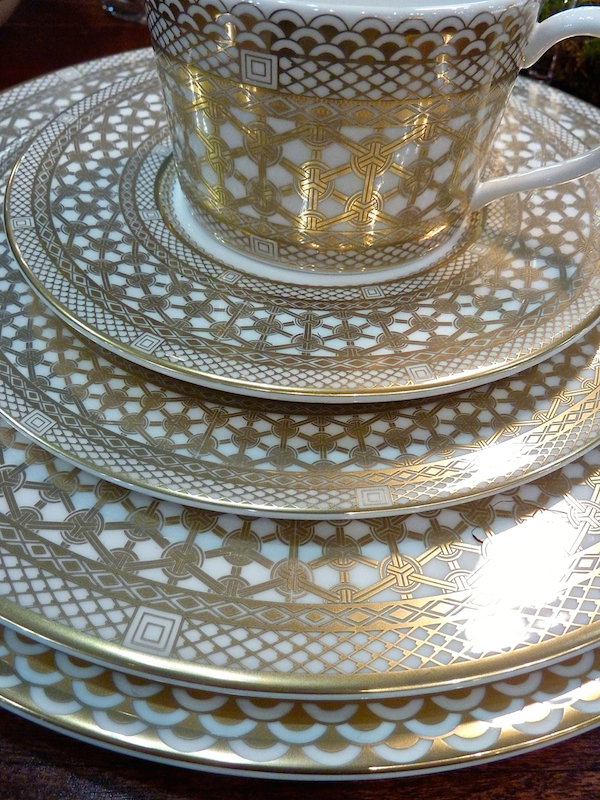 For tabletop, gold always lends an appropriate twinkle for special settings. 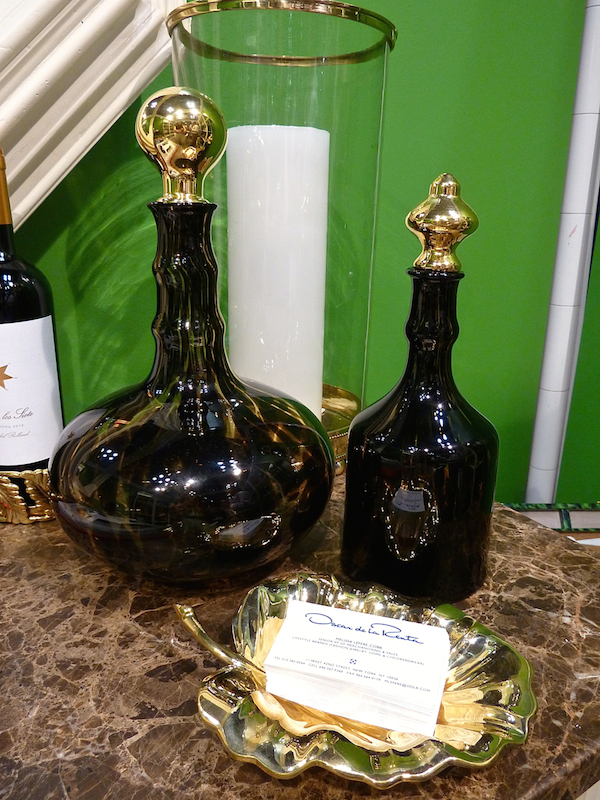 An early peek at Oscar de la Renta Home‘s holiday offerings included tortoise decanters with mildly exotic curves and gold tops, gold trimmed hurricanes and new leaf shaped accessory dishes. Their popular tortoise amber glassware now includes a pitcher with elegant gold handle and a statement making ice bucket (which of course could be repurposed for any number of fillings) with gold toned chiseled acorn top and matching tongs. While blue is still going strong, green made a spirited showing at the show, as seen in this smashing new tortoise print tray with gold toned handles. 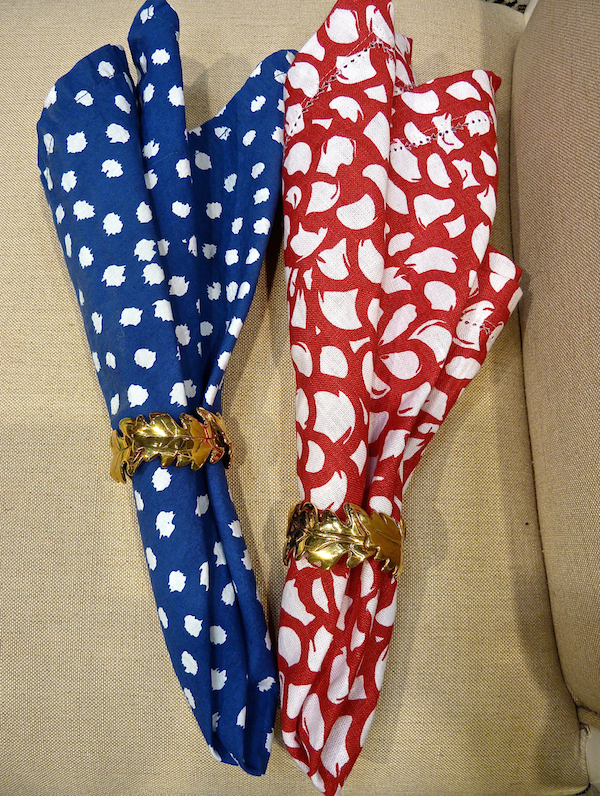 And pretty new leaf napkin rings are versatile additions to any scheme. Juliska introduced their new Acanthus dinnerware, available in all white or with hand painted 24 carat gold leaves, as shown below. 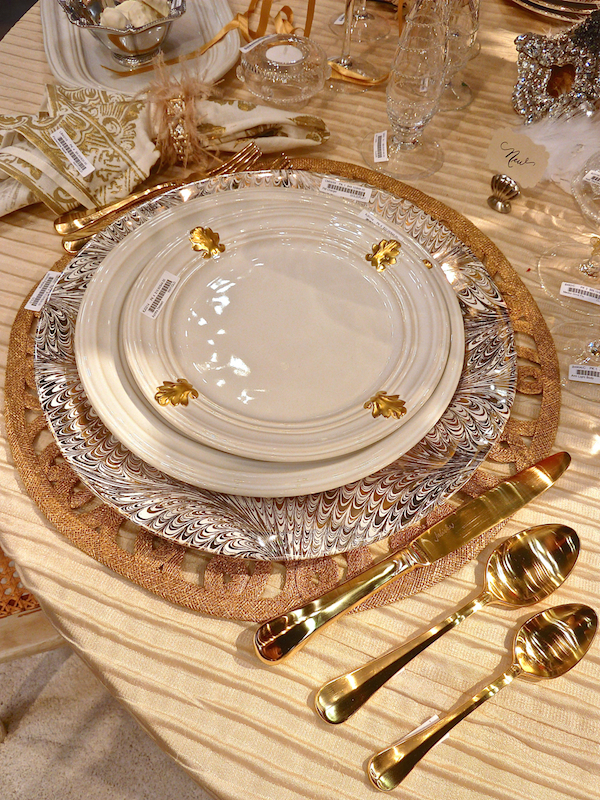 The new Bistro Gold flatware is the perfect accompaniment with the new hand cut and stitched Jardins du Monde Placemats. Kim Seybert is no stranger to holiday sparkle and this season added her Gold Crackle drinkware to the collection, shown here on the new brass-embellished Cheetah tray. 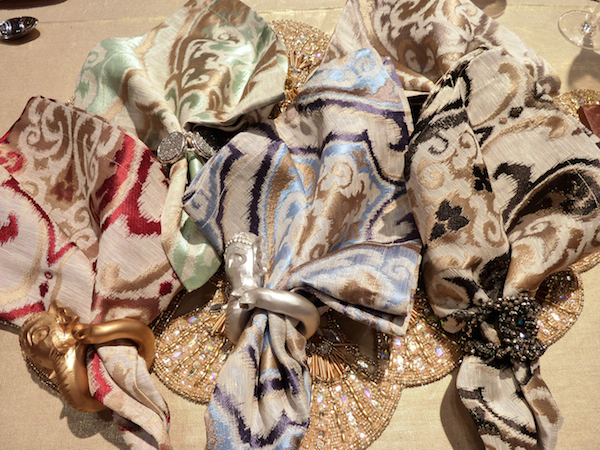 Gold enhanced jacquard napkins are new for the season in a variety of jewel toned colorways. 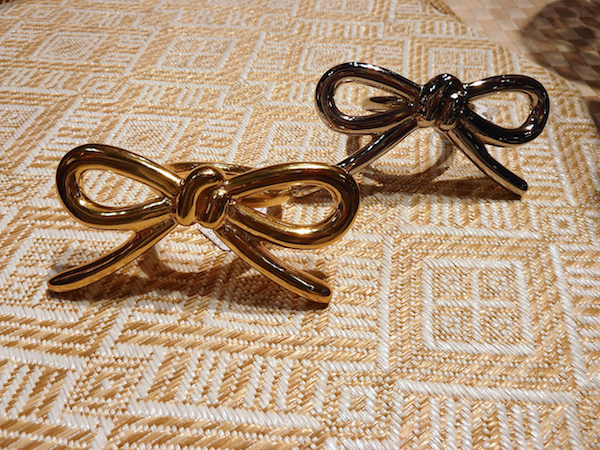 And these charming bow napkin rings are a simple way to set the table in golden style. I am a long time fan of Caskata‘s nature inspired porcelain. And this market they entered the luxury bone chine arena with Insignia C. Their first introduction in the line, Hawthorne, is a handsome geometric pattern with intricate layering and architectonic detail. 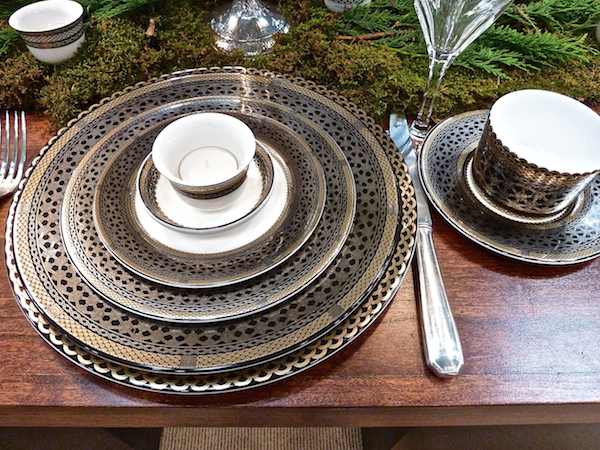 and the dramatic and dark Hawthorne Onyx, opulent with semi-matte gold and platinum on a lustrous black glaze. 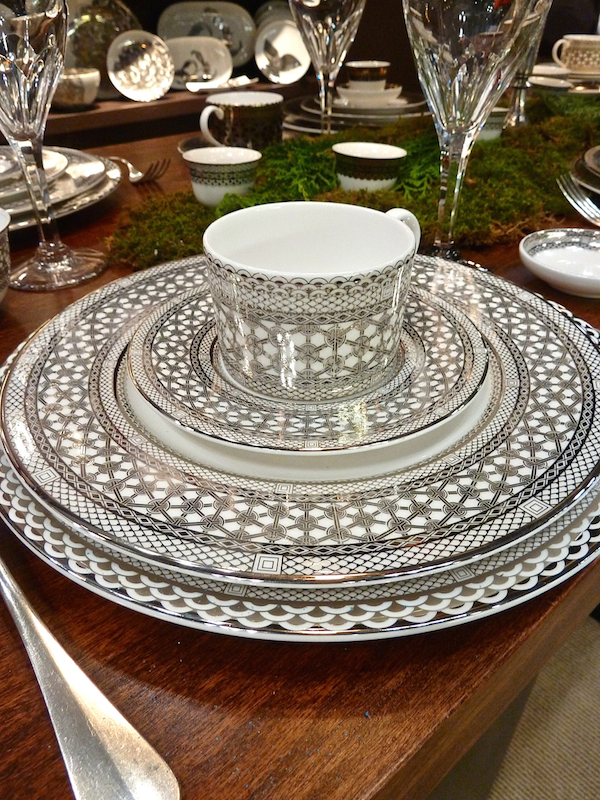 American made and surprisingly dishwasher safe, this is a noteworthy introduction in the luxury tabletop market. 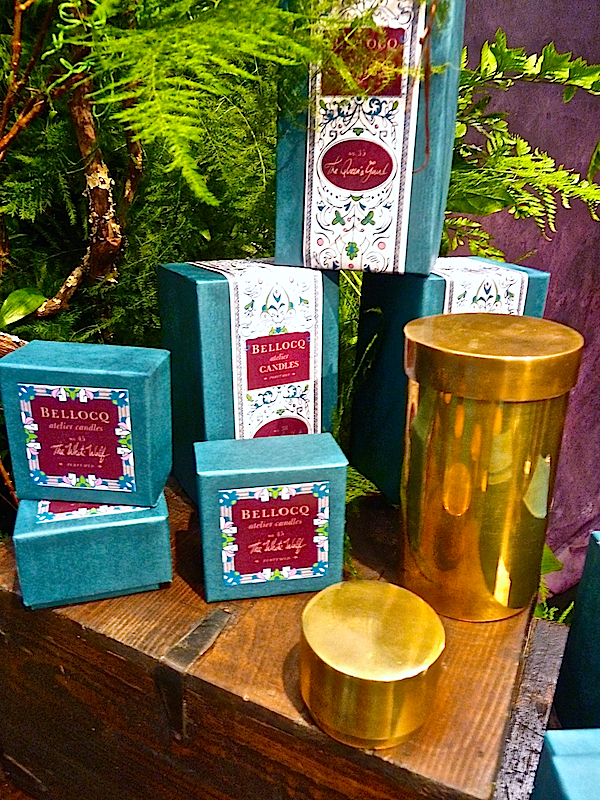 My favorite new candles I saw at this NY Now Market were those in the new Bellocq series. 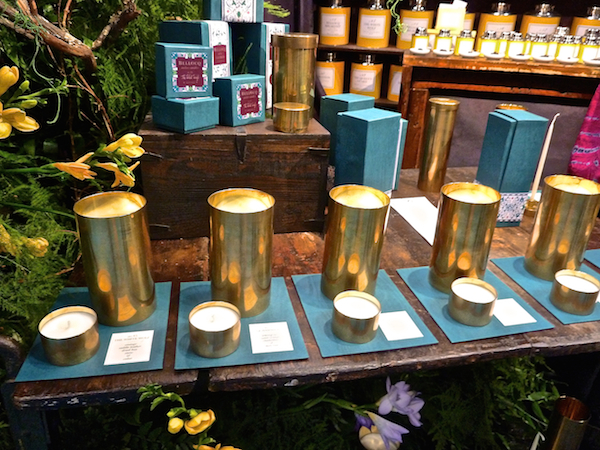 Based on the aromas of their wonderful teas, the candles are beautifully packaged in elegantly refined full size and compact travel brass cylinders. The outer packaging was not finalized and will evidently include metallics to match the minimalistic opulence of the candles. Six of the classic tea scents are represented: No.12 Le Hammeau, No.29 White Nixon, No. 38 Majorelle Mint, No.45 The White Wolf, No.47 The Queen’s Guard and No.54 Gypsy Caravan. 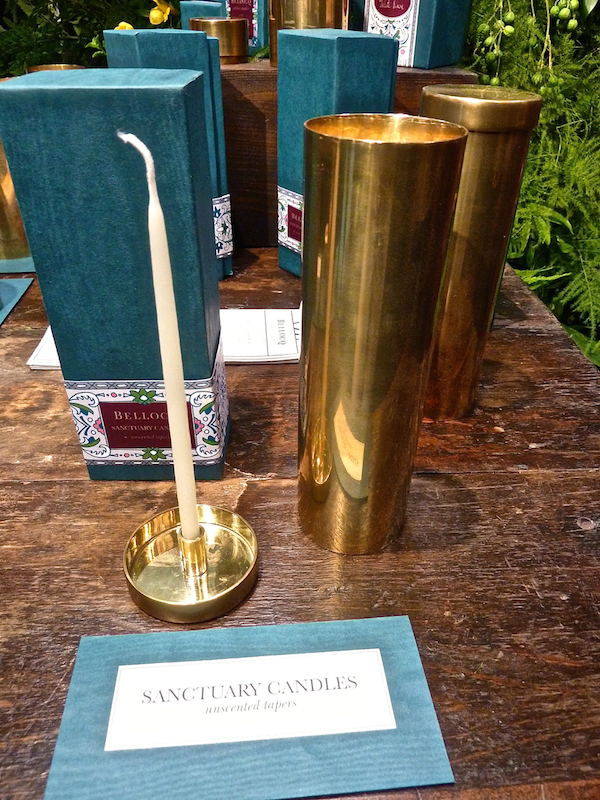 They also presented a lovely Sanctuary candle, although the actual tapers were not yet available. A marvelous hostess gift, with or without an accompanying tea, you will definitely want to order an extra for yourself. 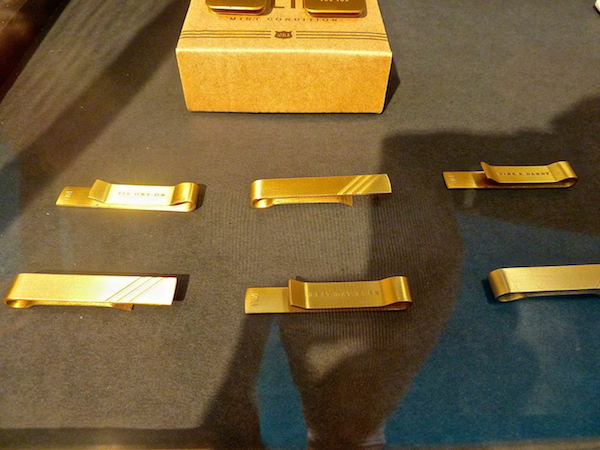 to tie clips, all the retro products are made contemporized with fun whimsical engraved messages. Great gifts and stocking stuffers for those hard to shop for guys. The easy to clean, stylish durability of Chilewich even had the Midas Touch. 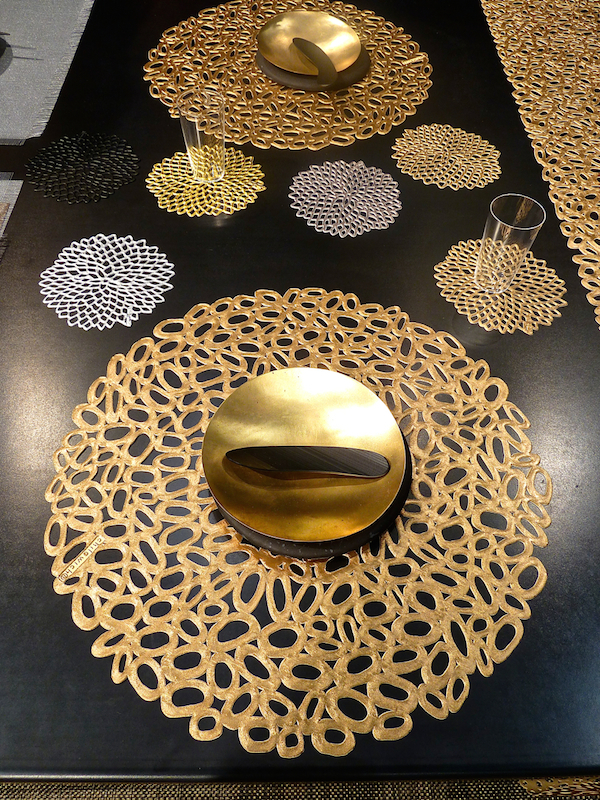 Their signature vinyl mats and coasters were proudly parading primarily warm metallics for the fall. Balancing “function with a refined modern sensibility,” Finell celebrates great design in the luxury of the everyday. 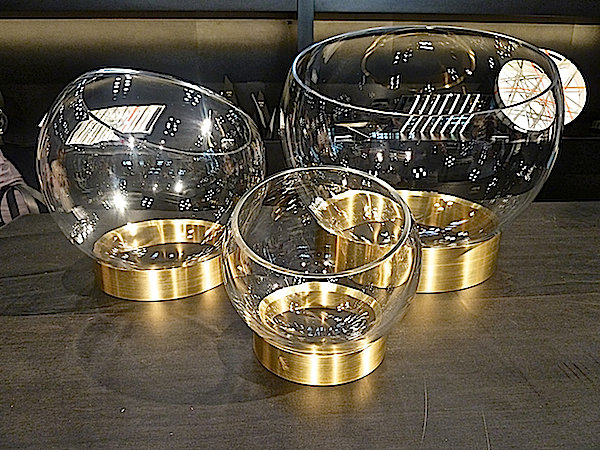 With a Scandinavian purity melded with American ingenuity, I loved the finesse of form of the beautiful Orb crystal bowls, shown here on the gold tone metal base. 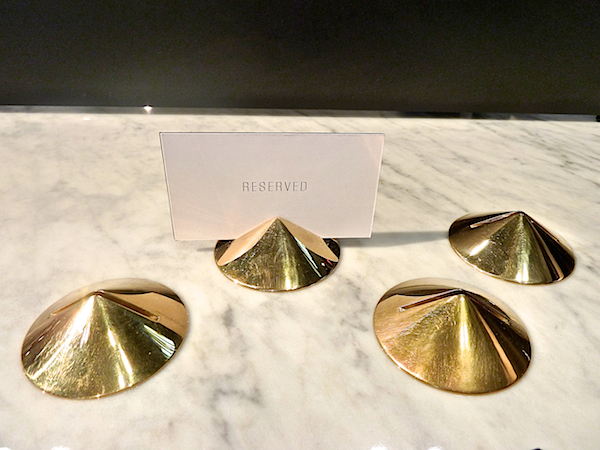 And the solid brass Spot place card holders are so elegant in their sophisticated simplicity. 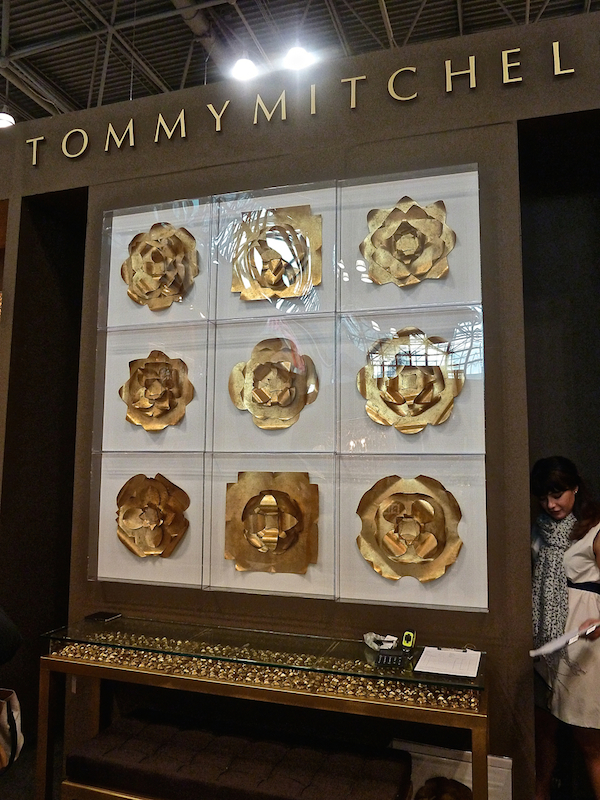 Tommy Mitchell‘s stunning booth featured his gilded tole flowers and furniture in glorious gold splendor. 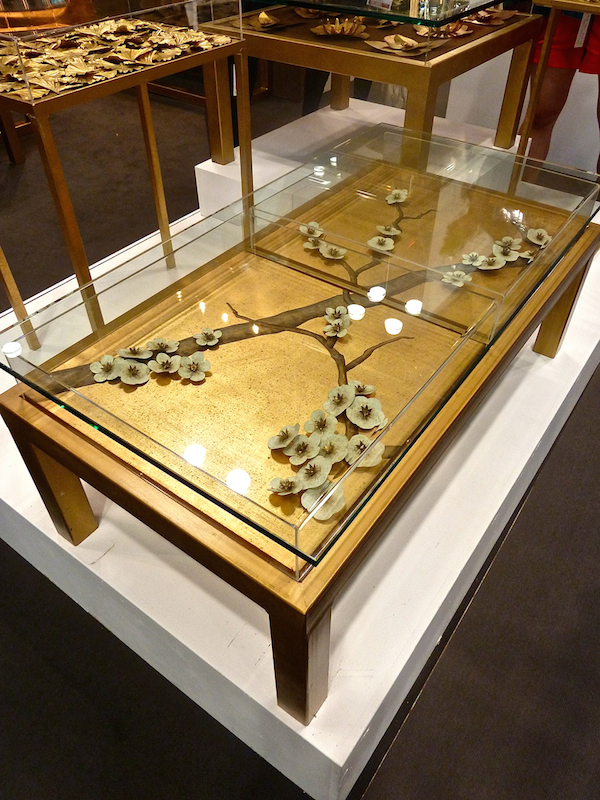 and coffee table offer a unique ornamental addition to the right space. These butterfly sconces are magical with their delicate decorative quality. Worlds Away has a strong history with painted metal finishes. 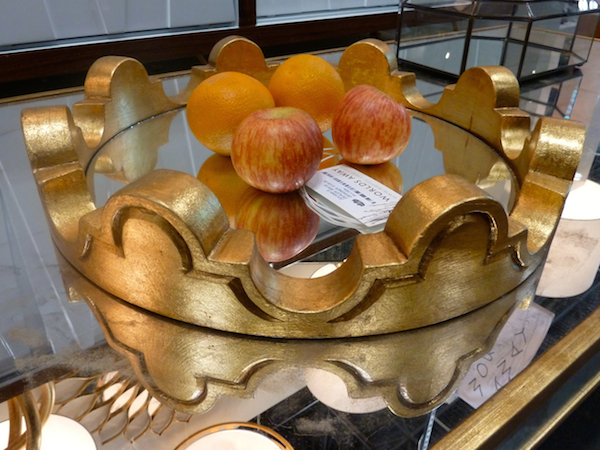 And while their larger introductions are usually at High Point, they did have several new items at this NYNow Market. 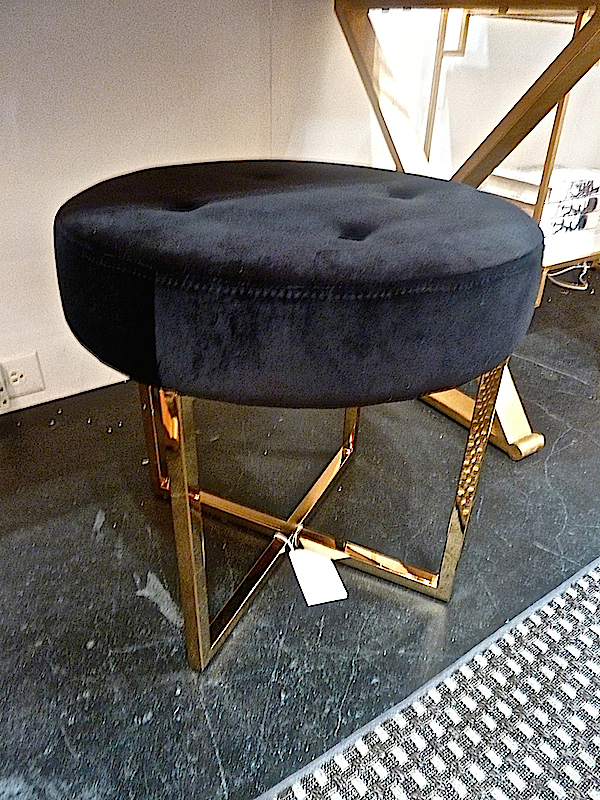 The vintage glam of the polished brass Melanie stool is perfect for extra seating from living room to vanity. 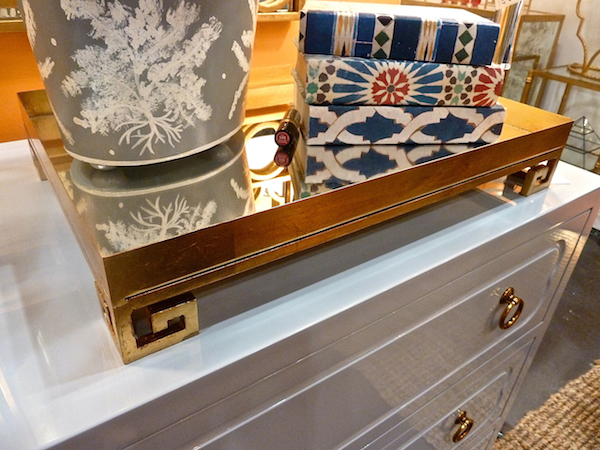 Trays are one of most useful decorative accessories and the mirrored glamour of the gold Julian with classic Greek key detailing would do stellar service in the bar, dressing or bedroom. 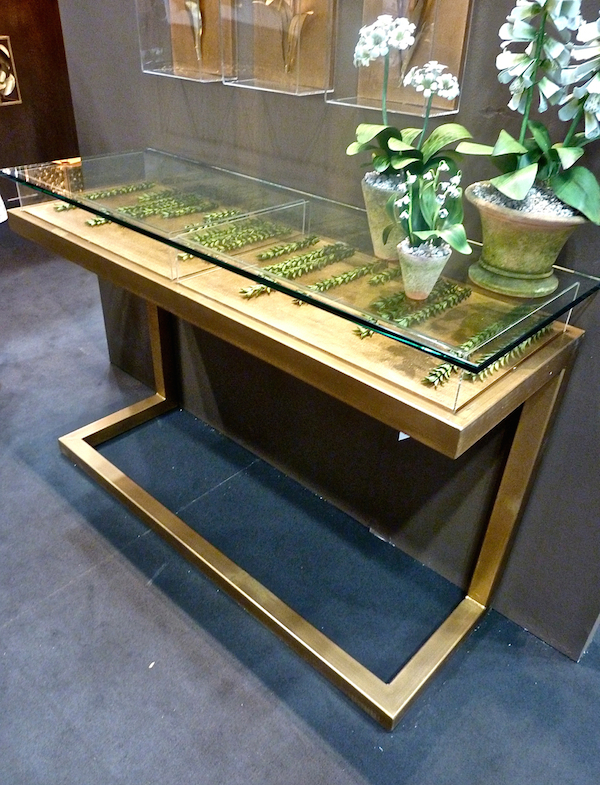 Its female counterpart, the Juliana tray, is the more overtly embellished version. 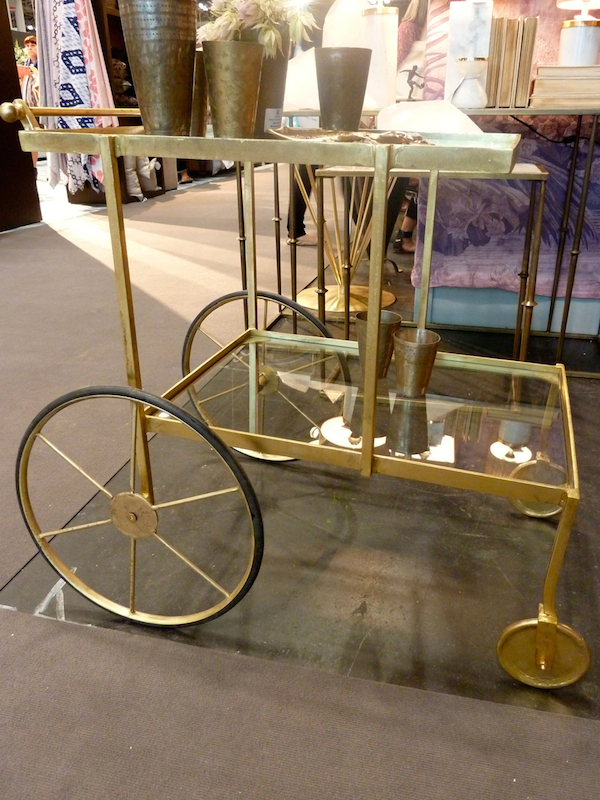 Who doesn’t love a bar cart? And the aptly named Glisten Bar Cart from Blue Ocean Traders does indeed do that with its fine lines and light angular design. 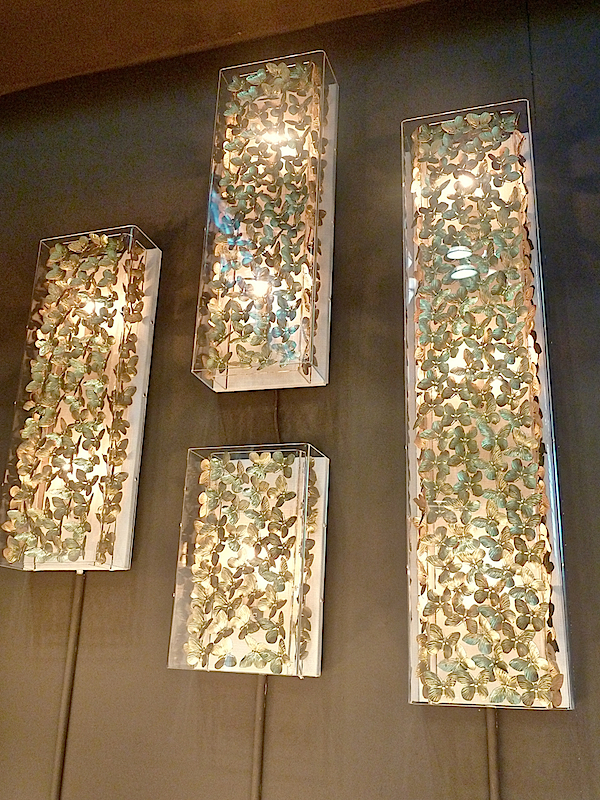 Modern History shared several new large decorative pieces. 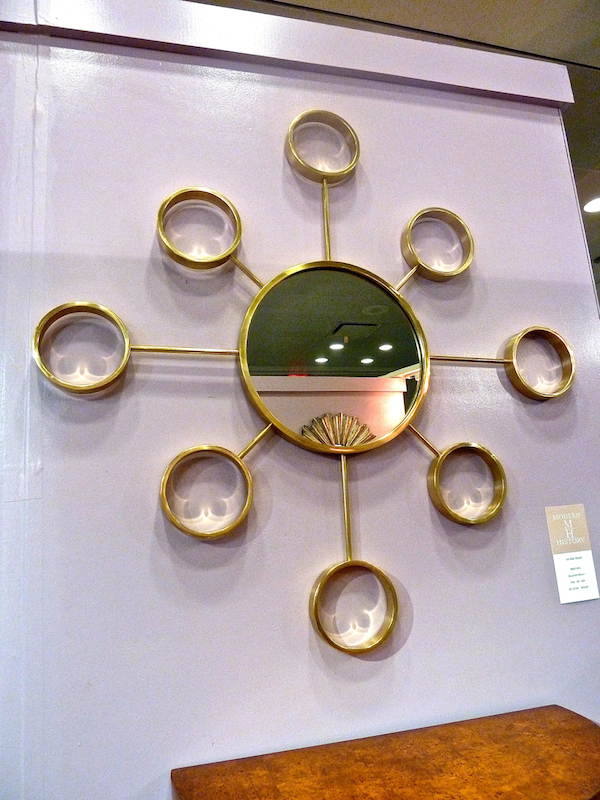 The Brass Orb Mirror is a great piece for a large wall without weighing it down. 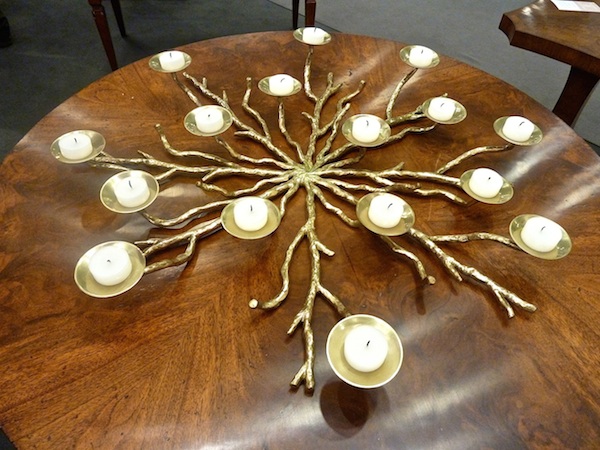 And the brass votive centerpiece is for those horizontal surfaces which need glimmering embellishment. Be sure to stop back tomorrow (Thursday) for the next episode in Susanna Salk’s and my video series. This entry posted in furniture, gifts, interior design. 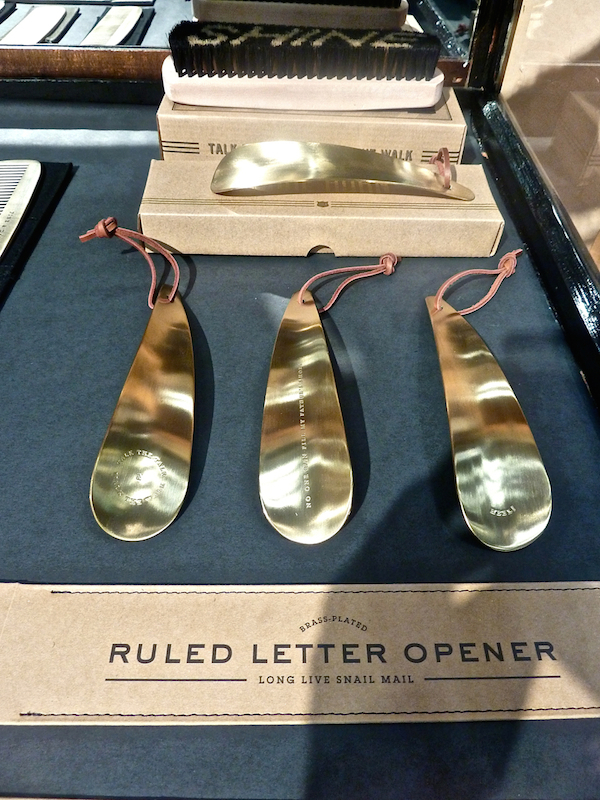 Entry Tags: brass in design, Decorating, decorative accessories, interior design, NY Now Bookmark the permalink. 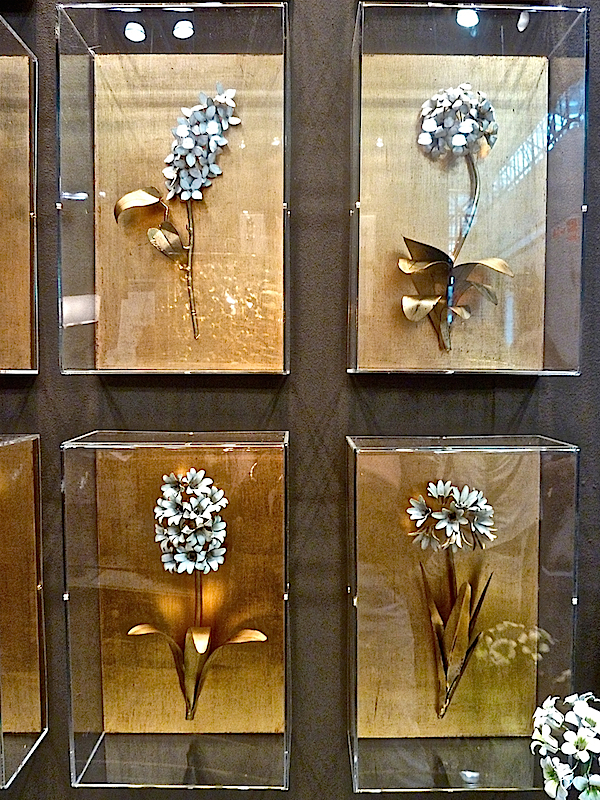 So many great things here and I am crazy about the white on gold Tommy Mitchell shadow boxes! 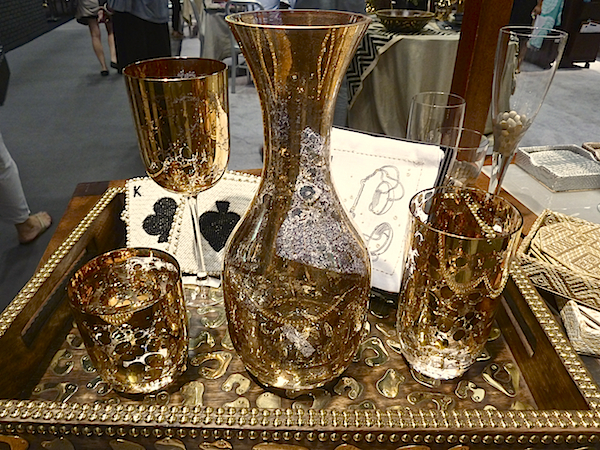 Wow – what a wonderful wrap up of all this glitters at NY Now! 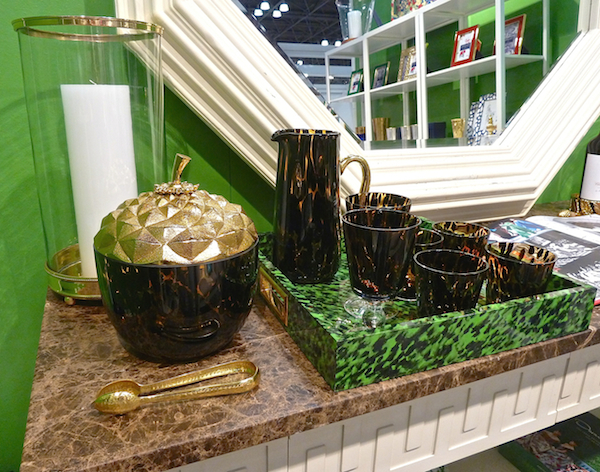 So love the Oscar mix of tortoise shell glass and gold and of course, Tommy Mitchell is a favorite around here. He and his wife are the loveliest people! Hope your summer is winding down on a high note. 78 queries in 0.515 seconds.